Cyber security impacts each and every one of us—in our businesses and in our personal lives. It even effects the biggest and most reputable organizations, with the greatest resources to protect themselves, from Anthem and Mattel, to Home Depot and LinkedIn, to so many others. 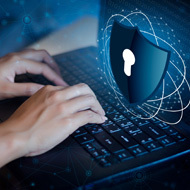 It matters because our reputations are built on trust—our customers, employees, vendors, friends and family trust us with their sensitive information—and a cyber security threat can compromise that. Also, in many cases as business owners, we’re required by law to protect sensitive information.